This is a zoom lens manufactured by Nikon and the model was launched 2005. This lens is designed and meant for Nikon cameras with a smaller sensor (often referred to as 'APS-C') which means that the lens does not fit all camera models. By clicking on the link below you can make sure that the lens works with your camera model and you should do an additional check with your local dealer as well, before you buy the lens just to be sure. The lens has a focal length of 18-200 mm. Since the lens is designed to be used on a camera with smaller sensor ('APS-C') the focal length will be equivalent to 27-300 mm on your Nikon camera. One thing to consider is that the lens has a variable brightness, which means that depending on how much you are zooming the lens will have a different maximum aperture value. At 18 mm the lens brightness is f/3,5 and at 200 mm the brightness is f/5,6. Through the link below you can read more about what this could mean for you as a photographer. If you buy this lens it will come with a lens hood, whose model name is "HB-35". Text from Nikon: "This versatile, 11x zoom with VR image stabilization, is designed exclusively for use with Nikon’s DX-format, and makes for a perfect one-lens solution. 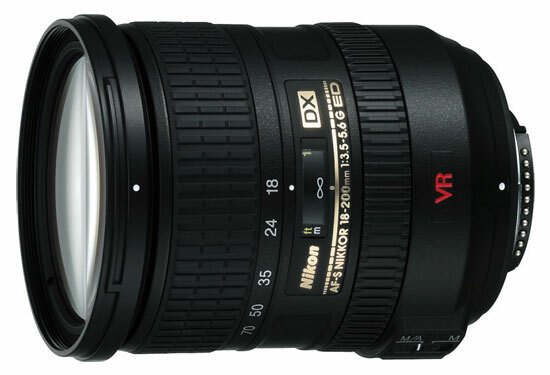 Offers broad 18 - 200mm focal range for use in a variety of situations, equivalent to a 27-300 lens in 35mm format. Nikon Super Integrated Coating (SIC) offers superb color reproduction while minimizing ghosting and flare. Delivers a high-level optical performance designed exclusively for use with Nikon DX digital format. Enables focusing from as close as 50cm (20 in.) from the subject through its entire focal range. Flower-shaped lens hood (HB-35) provides greatly reduced stray light. 11x zoom coverage offers a perfect compact and lightweight “one lens” solution. Two Extra-low Dispersion (ED) glass and three aspherical lens elements minimize chromatic aberration, astigmatism and other forms of distortion, while ensuring high resolution and contrast. Incorporates a Silent Wave Motor (SWM) allows for fast, quiet focusing. Employs a 7-blade rounded diaphragm opening that achieves a natural blur for out-of-focus elements. M/A mode for rapid switching between auto focus (A) and manual focus (M) operation. "